Florence Day Trips | Travel to Florence.com, your online travel guide. When visiting a large city it is often a good idea to take a day or two to explore some of the smaller cities that surround it. Florence Day Trips are a great way to discover the culture of an entire region not just a single city. Many times in Italy, Popes and bishops, ruling class and wealthy would take up residence in the beautiful Tuscan countryside to get away from it all and enjoy the good life. 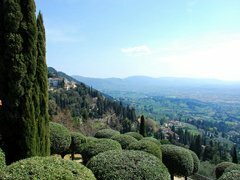 Fiesole was the retreat of the Popes and has a commanding view over Florence. 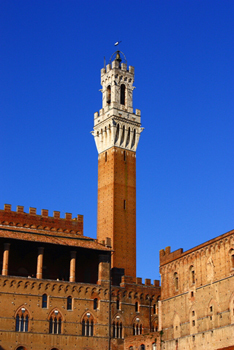 Siena, which is about 70 km south of Florence, was a powerful city in its own right and is a gastronomic hotspot. Siena has amazing shopping and provides a uniquely Italian feel to its visitors. A little farther (but absolutely worth the trip), is the amazing hilltop city of Orvieto. 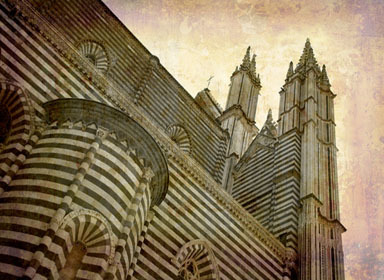 Orvieto is about a two hour trip south of Florence and is easily accessible by train. When you arrive in Orvieto, you will have to take the funicular up to the town which is perched at the top of a large hill. As you walk through the town you get the feeling that this city hasn't changed in a thousand years, which gives you a great sense of what it must have felt like to have lived there in the 13th century. Listed below are in depth articles about each city that will help you to familiarize yourself with the best attractions and things to see during your day trips. Travel by train is definitely the best way to get from Florence to any of your day trip locations and Rail Europe is a good place to go for your tickets. Click the link below for all your transportation needs.